These include the Sierra Pickup Style and the Survive SUV. With its good range of vehicles in the UAE, the most desired one for buyers here is Suzuki Jimny pickup truck. 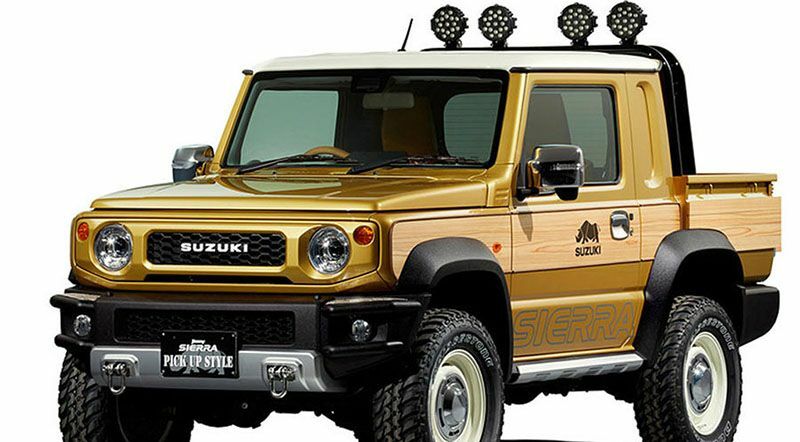 Keeping people’s demand here and other parts of the world, Suzuki is going to introduce two Jimny concepts at the 2019 Tokyo Auto Salon, which will start on January 11, 2019. The fourth-generation pickup truck was updated at the start of this year and now the automaker is introducing the Sierra Pickup Style concept and the Survive SUV concept. The Sierra Pickup Style is created for city drivers looking for a compact 4×4 offroader. On the front, it features an old-fashioned grille that looks similar to earlier vehicles, in addition to body panels with a wood-like impression. Talking about the Jimny Survive SUV concept, Suzuki created it for long outdoor tours. To make journeys smooth, it contains an elevated ride height, offroad tires, steel skid plates, and an external roll cage that lookalikes a set of roof racks. Suzuki did not reveal anything about the powertrains; however, the pickup truck comes with either a 660-cc turbocharged inline-3 or a 1.5-liter inline-4 in most markets. In the UAE, the only powertrain is 1.3L 4-cylinder mated to either a 5-speed manual or a 4-speed automatic transmission. While we do not know if these two Jimny concepts will go for production, we would love to see them in action here.